Lewis MacKenzie was born in Truro, Nova Scotia and is a graduate of Xavier Junior College of Sydney, Cape Breton, and the University of Manitoba. His military qualifications include the Canadian Army Command and Staff College, the NATO Defence College, the Canadian Forces Command and Staff College and the United States Army War College. During thirty-three years of military service, General MacKenzie spent nine years in Germany with NATO forces including a two-year tour with the British Army of the Rhine. He also served in nine peacekeeping tours in six different mission areas - the Gaza Strip, Cyprus, Vietnam, Cairo, Central America and Sarejevo. In 1990 he served as Commander of the United Nations Observer Mission in Central America, and subsequently was assigned as the Chief of Staff of the United Nations Protection Forces in Yugoslavia, before retiring from military service in 1993. Lew MacKenzie and his wife Dora have one daughter. 1994 - The Hon. Bertha Wilson, C.C., LL.B., LL.D. Bertha Wilson was born in Kircaldy, Fife and is a graduate of the University of Aberdeen, Scotland. In 1949 she emigrated with her husband, the Rev. John Wilson, to a small parish in Renfrew County, Ontario. In 1954 the Wilsons moved to Halifax, Nova Scotia where her husband was stationed as a chaplain in the Royal Canadian Navy and where, at the age of 32, Mrs. Wilson decided she would like to study law. After graduation in 1957, she worked briefly in Halifax before moving to Toronto. She was the first woman hired by Osler Hoskin and Harcourt, where she spent 17 years and became its first female partner. She was the first female judge appointed to the Ontario Court of Appeal in 1975, and in 1982 became the first woman appointed to the Supreme Court of Canada, retiring in 1991. Madam Justice Bertha Wilson has received degrees from 22 Canadian universities, from the University of Aberdeen, and from Chatham College in Pittsburgh, PA. She was appointed a Companion of the Order of Canada in 1992, and lives with her husband in Ottawa. The photo [left] shows the 1994 Scot of the Year award being presented by the 1993 recipient, Major General Lewis MacKenzie. 1995 - Lloyd Robertson, O.C. Lloyd Robertson is one of Canada’s most recognized and respected news anchors whose career in broadcasting goes back over four decades. After a brief spell at Guelph radio station CJOY, he joined the Canadian Broadcasting Corporation in 1954 as a staff announcer, spending time in Winnipeg and Ottawa prior to moving to Toronto to join CBC Weekend News. From 1970 to 1976 he anchored CBC’s The National and joined the privately owned Canadian TV Network (CTV) in October of that year to co-anchor CTV National News with Harvey Kirck. 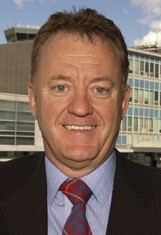 He was appointed CTV’s Chief Anchor and Senior News Editor in 1983 and presently anchors CTV News. He is held in high regard by his viewers, having been chosen Most Trusted TV Journalist, and has received numerous honours from the broadcast industry including the prestigious Gemini Award, Broadcaster of the Year, and the Radio & Television News Director’s Association’s President’s Award. He was appointed an Officer of the Order of Canada in 1998. Lloyd Robertson and his wife Nancy have four daughters. 1996 - The Hon. 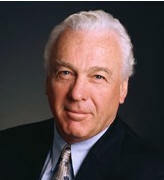 Donald S. Macdonald, P.C., C.C., LL.M., LL.D. A graduate of the University of Toronto, Osgoode Law School, Harvard Law School and Cambridge University, the Hon. Donald S. Macdonald served in the Canadian House of Commons from 1962 to 1978. Between 1968 and 1977, he held the Cabinet positions of President of the Privy Council, Minister of National Defence, Minister of Energy, Mines and Resources, and Minister of Finance. Mr. Macdonald is presently Counsel at the national law firm McCarthy Tetrault, returning to that position after completing his posting as Canadian High Commissioner to Great Britain and Northern Ireland. His ancestors emigrated from Lochaber, Scotland to Antigonish, Nova Scotia at the end of the eighteenth century. He retains an interest in his genealogy and assists the Clan Donald as a trustee of the Clan Donald Lands Trust at Armadale, Skye. Since there are five other Donald Macdonalds who are trustees, he thought of calling himself Donald Toronto, except they might have thought he was passing himself off as an Anglican Bishop. 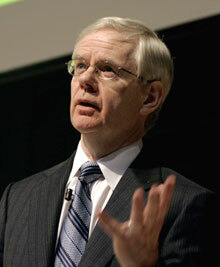 Donald Macdonald was appointed a Companion of the Order of Canada in 1994, and lives with his wife Adrian in Toronto. 1997 - Colonel The Hon. Henry N.R. Jackman, C.M., O.Ont., K.St.J., LL.D. Hal Jackman, as he is known to his friends, from December 11, 1991 until January 24, 1997 served as Ontario’s 39th Lieutenant Governor, since John Graves Simcoe arrived in Upper Canada in 1791. He was born in Toronto and is a graduate of the University of Toronto. Mr. Jackman serves as Chairman of many boards including National Trust Company, The Empire Life Insurance Company, E-L Financial Corporation Ltd., and Algoma Central Corporation. He is also Vice-Chairman of The Dominion of Canada General Insurance Company and president of a number of other companies. Among his many charitable and philanthropic activities, he is Chairman of the Atlantic Council of Canada, the Advisory Board of The Toronto Old Aged Men’s and Women’s Homes, and the Board of Trustees of the Canadian Red Cross Pension Fund. He was appointed Honourary Colonel of the Governor General’s Horse Guards in 1992. He is a Knight of Justice in the Most Venerable Order of the Hospital of St. John of Jerusalem. Hal Jackman and his wife have five children. The 1997 award to the Hon. Hal Jackman was presented by the 1996 recipient, the Hon. Donald Macdonald who, by coincidence, happened to contest the Federal riding of Rosedale against Hal Jackman on three occasions many years ago. The winner on each of those occasions was Donald Macdonald, and since Mr. Jackman has Campbell ancestry, there was a certain rough justice in the victories - harking back to the actions by the infamous Campbells at Glencoe! Both speakers referred to this ancient antipathy, but with a great sense of humour. 1998 - John E. Cleghorn, B.Comm., C.A. A graduate of McGill in 1962, John Cleghorn articled as a Chartered Accountant with Clarkson Gordon before becoming a sugar futures trader. He joined the Royal Bank in 1974 from the old Mercantile Bank of Canada and rapidly rose to become President in 1986, Chief Operating Officer in 1990, Chief Executive Officer in 1994, and Chairman in 1995. Mr. Cleghorn has been deeply involved with the academic profession, and is Chancellor of Wilfried Laurier University, a governor of McGill University and Chairman of the McGill Fund Council. 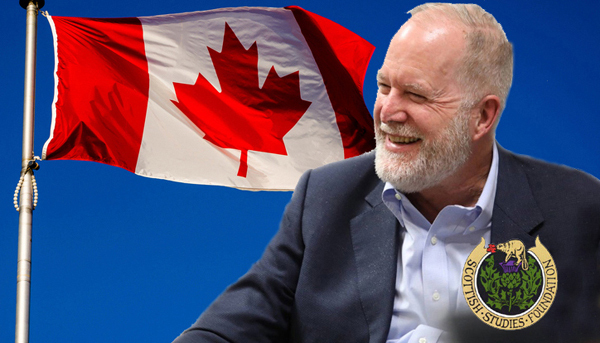 Among his many other national community activities, he is Vice-Chairman of The Conference Board of Canada, a director of the International Monetary Conference, a member of the Policy Committee of the Business Council on Monetary Issues, the national advisory board of the Canadian Special Olympics, and governor of the Shaw Festival Theatre. His great grandfather emigrated from Wick, Caithness in the 1860s and was active in the grain and shipping business until his early 70s. John Cleghorn and his wife Pattie have three children. And he has Fraser ancestors. 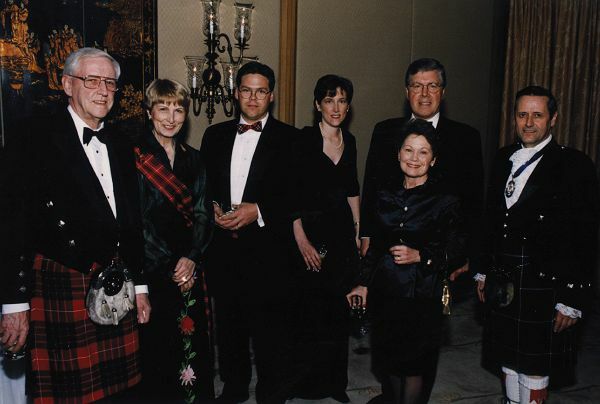 Among the many noteworthy people who attended the 1998 dinner, one deserves special attention. 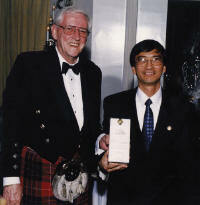 The photo [right] shows dinner chairman Neil Fraser presenting one of the door prizes (Dalwhinnie Single Malt) to Arthur Lee, the immigrant businessman who paid over $400,000 at auction for the service medals of Colonel John Macrea of Guelph, Ontario, whose poem "In Flanders Field" is a gift to Canada and the world, decrying the conflicts that many came to this country to escape. Mr. Lee then donated the medals to the Museum of Guelph. As you can imagine, there was not a dry eye in the room, and Mr. Lee received a standing ovation. Oscar winner and a Canadian Titan in the fascinating world of entertainment, Michael MacMillan is Chairman and Chief Executive Officer of Alliance Atlantis Communications, a multi-million dollar company which created headlines in July 1998 when MacMillan’s Atlantis Communications joined forces with Alliance Communications to become Canada’s largest television and movie production company. Born in Scarborough, Ontario, Michael graduated from Upper Canada College with honours, as he did from Queen’s University, with Honour BA in Film Studies. With two friends, he launched Atlantis Films Ltd in 1978 with a total capital of $300, their life savings. Michael MacMillan is on the Board of Governors of the Canadian Stage Company, Toronto East General Hospital Foundation, the Canadian Film and Production Association and is Vice-Chairman of the Canadian Film Centre and a Trustee of the Gaelic Society of Toronto. When he’s got time on his hands, he enjoys marathon running. Michael MacMillan and his wife Cathy Spoel have three children. 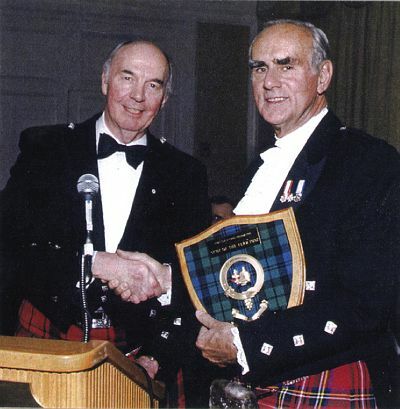 The 1999 award to Michael MacMillan was presented by the 1998 recipient, John Cleghorn, attired in Ancient Hunting Fraser Tartan, in honour of his Fraser grandmother. John recounted how Michael and one of his partners were off on a fishing trip to New Brunswick by air when they thought they would surprise two late-arriving Royal Bank officials. They hid behind two seats in the plane and jumped out when the new passengers arrived. To the astonishment of everyone, the boarding passengers were not the Royal Bank officials but rather U.S. Secret Service personnel guarding former U.S. President Jimmy Carter, also on the same flight. Fortunately, the Secret Service guards asked questions first, rather than opening fire and asking questions second. you came from, how do you know where you belong. He noted that the Scots have always been a mobile people who traditionally looked beyond their own borders for opportunities, and cited as an example, Alexander Graham Bell (1847-1922), a remarkable man, born a Scot, buried in Canada, whose epitaph read: "died a citizen of the United States." 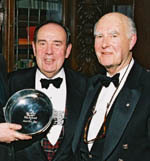 Michael MacMillan, the 1999 recipient, presented the 2000 award to Red Wilson, who looked resplendent in his new Wilson tartan and formal Highland accessories. He was also the surprised recipient of a large cake, complete with sparklers, in celebration of his birthday [a secret passed on in confidence by his dedicated assistant, who shall remain anonymous]. Red Wilson and his wife Brenda have two daughters and one son. In addition to her business pursuits, Kathie has always found time to be active within the community at large. Dedicated to the objectives of MADD (mothers against drunk driving), she is currently Vice Chair of its board as well as the Chair of its Finance and Resources Committee. She also chairs the Gender Portrayal Panel for Advertising Standards Canada. She is also a member of the Marketing Committee for the United Way of Greater Toronto. Kathie’s interests include telling a good joke, enjoying fine wines, exploring the parks of Toronto with her two dogs, and a keen passion for golf - anytime, anywhere! 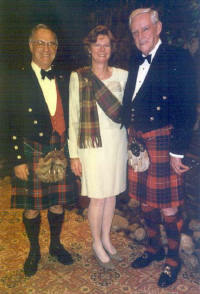 Kathie Macmillan graciously accepted the 2001 Scot of the Year award from the 1999 recipient, Michael MacMillan, Chairman and CEO of Alliance Atlantis Communications, who happens to be a distant cousin. Having spent five years chairing the dinner and serving as MC, it was a pleasant change for Neil to sit back and relax. We enjoyed seeing Margaret Struth of Burnett’s and Struth Highland Wear in Barrie, Ontario, and meeting Alistair Buchan, Chairman of Lochcarron, one of the largest manufacturers of tartan in Scotland. As fellow members of the Scottish Tartans Authority, Neil and Alistair found a lot to talk about during dinner. Unfortunately, a previously scanned photo of Kathie with Alistair and Neil, taken at this event, was lost in a recent crash of our computer’s hard drive and our quirky scanner is currently not functioning properly, to allow the photo to be reproduced for this article. The individual nominated to receive this year’s award is Alistair MacLeod, who was born in North Battleford, Saskatchewan in 1936, and at the age of ten returned to the family farm in Cape Breton. After completing high school, MacLeod attended teacher’s college in Truro and then taught school. Deciding to further his education, he attended St. Francis Xavier University between 1957 and 1960 graduating with a BA and B.Ed. MacLeod then went on to receive his MA in 1961 from the University of New Brunswick and a Ph.D. in 1968 from the University of Notre Dame. A specialist in British literature of the 19th century, MacLeod taught English for three years at the University of Indiana before accepting a post in 1969 at the University of Windsor where he is a Professor of English and Creative Writing. He and his family return to Cape Breton every summer, where he spends part of his time…"writing in a cliff-top cabin looking west towards Prince Edward Island." He is the author of "No Great Mischief". Started originally as "Tartan Day in Nova Scotia," Jean Watson approached every provincial Legislative Assembly in Canada, as well as other Scottish-cultural societies across Canada, to help get such a date established. 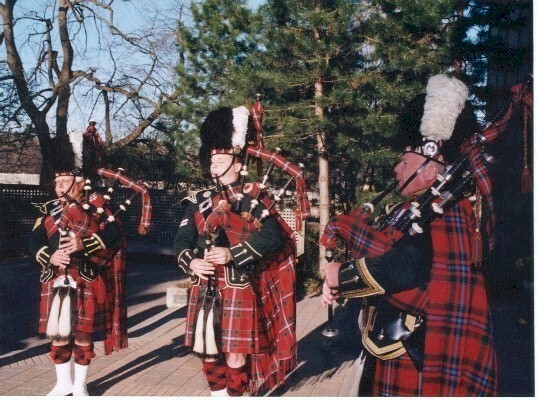 After ten years of work, Tartan Day in Canada was approved in every Provincial Assembly from sea to sea by Premier's proclamation or Members' Bill, the last being in the National Assembly at Québec City, where it was finally proclaimed in December 2003 -- 16 years after the first such proclamation in Nova Scotia. In Canada, Tartan Day, April 6th, Canadians are encouraged to wear tartan in commemoration of the contributions of Scots and their descendants to the fabric of their society. 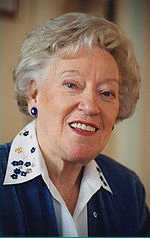 Jean was born on May 29, 1936 in Pictou, Nova Scotia and is the daughter of Angus and Rita (Nee: Heighton) MacKaracher. She was a cancer survivor at age fifteen which took a toll on her youth and education. Despite this, she moved to Halifax in 1958 and continued to work there as a bookkeeper for twenty-one years. She liked to draw from a very early age and went on to become an amateur artist gaining her teaching status some twenty-five years ago and still teaches art classes on a regular basis. She founded the Dalriada Art Group which she still manages, and assisted other art groups to form. As a child, her parents always encouraged her interest in her Scottish background and she delved into her history after joining the Federation of Scottish Clans In Nova Scotia and has served as its President on two different occasions. 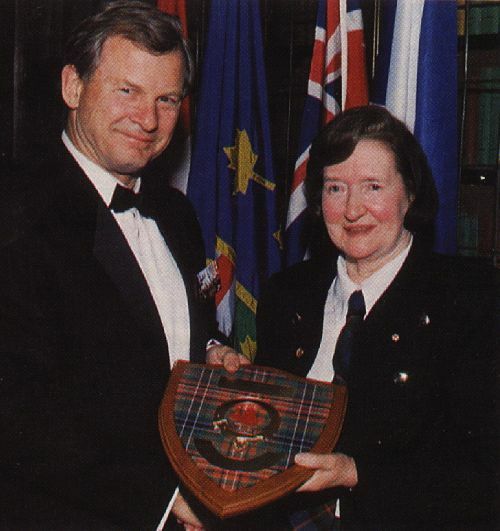 She and her husband founded the Pipes and Drums of Clan Farquharson in 1981 and she served as their President for six years. 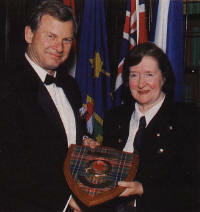 She was a founding member of the Clan Farquharson Society of Canada later founding the Clan Lamont Society of Canada, the Clan Watson Society of Canada and in 2002 the Stewart/Stuart Association of Nova Scotia, helping all to get active and, at various times, serving as President for each Society. She served from 1996 to 2000 as President of the Royal Canadian Legion, in Waverley, N. S. (Branch 90) during which time she received the Meritorious Service Award for her work in preventing the closure of this Branch. She is a 30-year member of the Legion and has been active in various Heritage Societies and community endeavors. In 2004 she was recognized by the St. Andrews Presbyterian College, Scottish Heritage Center in Laurinburg, North Carolina for her work in promoting "Tartan Day April 6th" and received the Flora Macdonald Award. 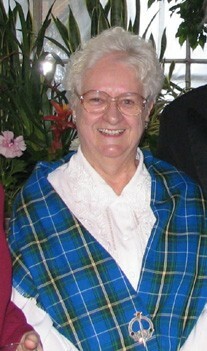 She served as a one-person committee for ten years following "Tartan Days" initiation by the Federation of Scottish Clans In Nova Scotia in 1986 and, as a result, has justly become known as "The Mother of Tartan Day." As if all of this were not enough, at age 70 she had her first song released on CD: "Isobel's Song" a ballad about the attack on Toward Castle, in Argyll, Scotland in the 1700's. The former cabinet minister who served in the Canadian federal government in the 1970s and 80s. 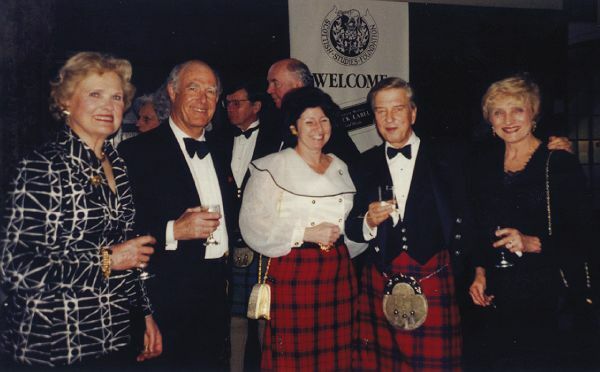 Flora MacDonald may not be foreign minister any longer, but you wouldn't know it from her itinerary. At 82, she is still adding to a travelogue that includes at least 100 countries in her concern for the plight and progress of women in developing countries. Named after the Scottish Jacobite heroine of Bonnie Prince Charlie fame, Flora MacDonald was born in North Sydney, NS, a sixth generation Canadian whose forebears came to Canada from the Scottish Highlands in the 1790s. She was educated in public schools and business college in Nova Scotia. Later she became the first woman enrolled in the National Defence College’s year-long graduate course in international relations. Prior to her election, Flora was administrative assistant and tutor in the political studies department at Queen’s University, and was also employed at the national headquarters of the PC Party of Canada becoming acting national director. Since leaving politics she has held numerous national and international posts and has served on the board or advisory councils of many organizations. She is an Officer of the Order of Canada, a Companion of the Order of Canada, and a member of the Order of Ontario. She has received the Jordanian El Kawkab Medal by King Hussein for significant contribution to public service; the Pearson Peace Medal; the Churchill Society’s award for Excellence in the Cause of Parliamentary Democracy; and was the first Canadian to receive the Padma Shri Award (India’s highest award to civilians) from the President of India for distinguished service in the field of public affairs. She holds honorary degrees from universities in Canada, the United States and United Kingdom. 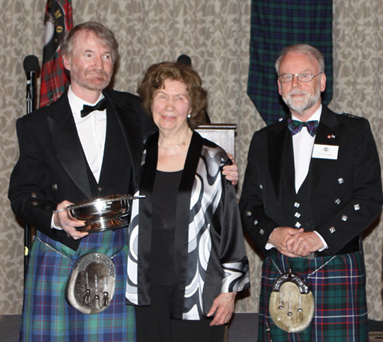 18th annual "Scot of the Year Award" presented to Richard Wernham B.A. LL.B in recognition of his role in supporting cultural and educational activities in Canada. Richard is a power to be reckoned with. He has more than twenty years’ experience in the global wealth management industry and was the founder and Chief Executive of Global Strategy Financial, one of Canada’s largest independent mutual fund companies. Currently the Chairman of the Soutterham Group, he was formerly a lawyer with Torys, specializing in securities and corporate law. Richard was also a Special Lecturer in Law, Trinity College at the University of Toronto from 1977-1994 and remains active in the academic community holding appointments as Chair of the Board of Greenwood College School, as a Trustee and member of the Foundation’s Joint Foundation/School Strategic Planning Committee of Lakefield College School, and as a Chair of the Investment Committee for Upper Canada College. 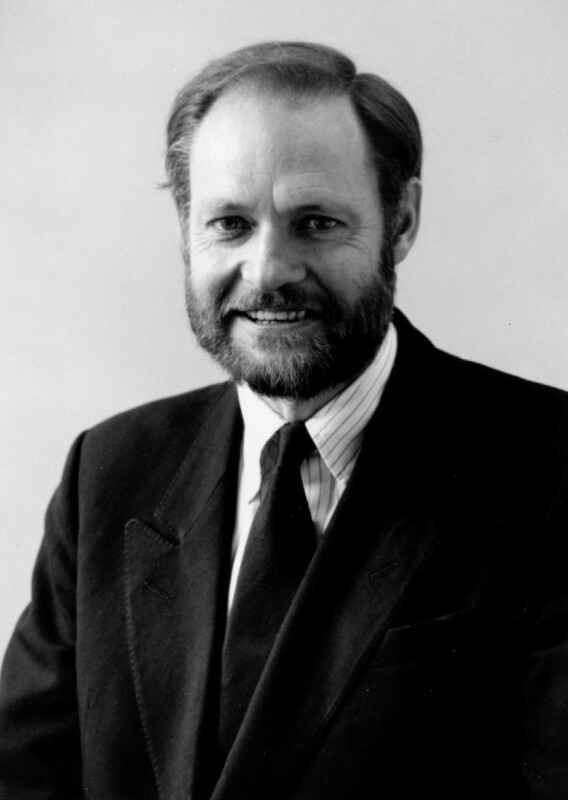 Richard has been a significant financial supporter of the academic community, and with his wife, Julia, funded the establishment of the Richard Wernham and Julia West Centre for Learning at Upper Canada College. Richard also co-founded Greenwood College School, a co-educational independent day school in Toronto. The Robert L. Payton Award 2010 was presented to Richard by the Council for Advancement and Support of Education. He is a Governor of the Royal Ontario Museum. 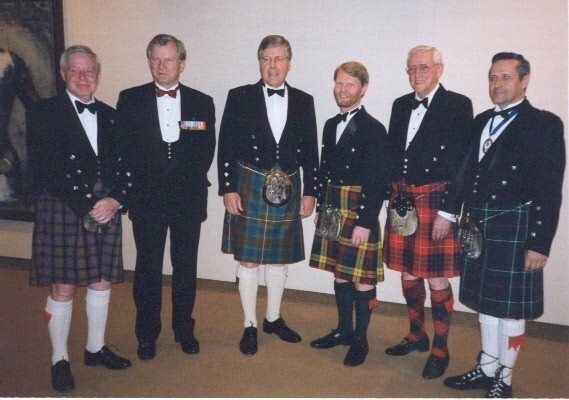 2011 - Scots-Canadian mining engineer, businessman and philanthropist Robert M. Buchan in recognition of his role in supporting philanthropic and educational activities in Canada and Scotland. Born in Aberdeen and brought up in Rosyth, Fife, Mr. Buchan graduated with a B.Sc. 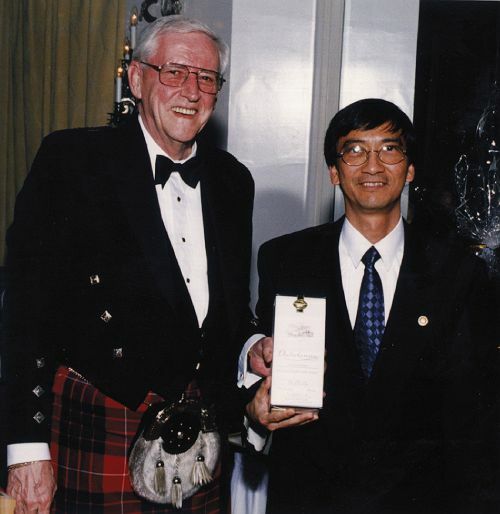 (hons) in Mining Engineering from Heriot-Watt University in Edinburgh in 1969 and in 1971 obtained a Masters in Mineral Economics from Queen's University, in Kingston. From 1971 to 1974 Mr. Buchan worked as a design engineer at Joy Manufacturing and then as a Securities Analyst at A.E. Ames from 1974 to 1978 and at BBN from 1978 to 1984. He participated in the formation of CMP Funds, and served as its President from 1984 to 1988 and also participated in the creation of Dundee Bancorp in 1987 and served as its Vice-Chairman until 1994. During that period, he ran the merchant banking division, DCC Equities. In 1994, he left Dundee to form Kinross Gold Corporation acting as that company's CEO from 1993 to 2004 and in 2005 he started Katanga Copper Company, and served as that company's Chairman until 2007 when he formed Allied Nevada Gold Corporation serving as that company's Chairman since inception. Throughout Mr. Buchan's career, he has served on numerous boards of resource companies, as well as being Chairman of Quest Capital. Is a senior partner of McKinsey & Company, where he has worked for nearly 30 years. He was the managing director of the Canada office for eight years and then convened the firm’s global Operations Practice. Bruce now co-leads the New Ventures Competition (NVC). This venture capital approach identifies, funds, and incubates startups inside McKinsey, leveraging McKinsey’s unparalleled access to leading companies and go-to-market channels to help them move rapidly from startup to scale up. NVC also seeks promising disruptive technologies outside the firm and builds collaborative partnerships with entrepreneurs and research institutions to develop applications for McKinsey clients. Bruce serves major institutions in the aerospace, mining, and industrial sectors, as well as in the public sector, and he is an advocate for Canadian competitiveness in international business. 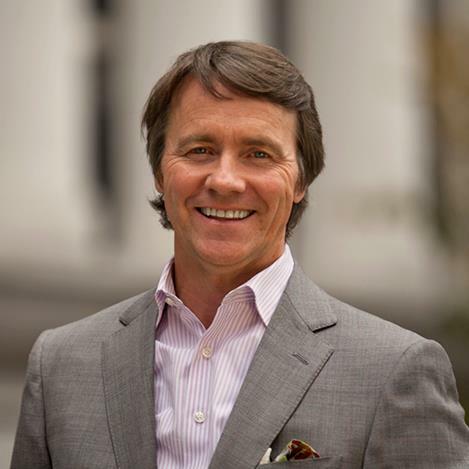 His work includes designing and implementing transformation programs with large companies seeking to improve their business performance and achieve cultural renewal while fully engaging and aligning employees at all levels. He has extensive expertise in agile leadership, focusing on how leaders can build skills to handle volatility and unpredictability in their businesses. In addition, he helps clients develop strategies for long-term success that also address stakeholders’ economic, social, and environmental concerns. Before moving to Canada in 2000, Bruce held various leadership roles at McKinsey in New York and Paris. He spent 12 years cofounding then helping to build the firm’s Operations Practice in Europe. Prior to joining McKinsey, he held various marketing and product management positions at P&G in Europe. Bruce has published articles and given speeches on Canada in the Pacific Century, public sector productivity, business in society, and Canada-Japan and Canada-China business relationships. He is active in the community on healthcare, corporate social responsibility, and human rights issues. He serves on the boards of Catalyst, Human Rights Watch, and the Trans Canada Trail. He holds a BA and an MA in law from Cambridge University, an MBA from The Wharton School, and an MA in international studies from the Joseph H. Lauder Institute for Management & International Studies at the University of Pennsylvania. Bruce was awarded a Churchill Medallion by Her Majesty the Queen for exploration in China, was a professional ski racer and musician, and is a keen sea kayaker in the Arctic. He and his wife Tracy have three sons. He was also awarded the Scot of the Year in 2017 by the Scottish Studies Foundation of Toronto. 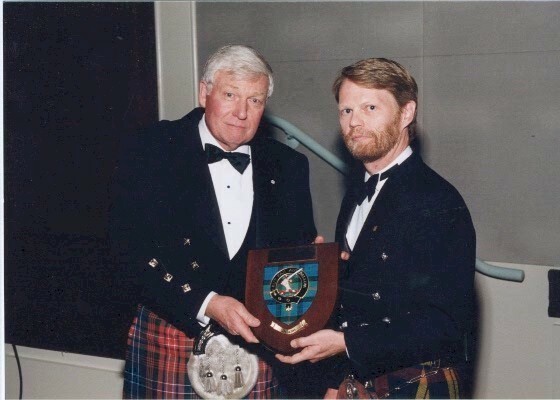 It was back in 1993 that we initiated our Annual Scot of the Year Award to honour individuals with a Scottish connection who have achieved distinction through their contribution to Canadian society or the international community at large and at our 2018 event during which we paid tribute to this year's recipient: Graham Fraser, Canada's sixth Commissioner of Official Languages, a former Canadian journalist and a writer whose Scots ancestry can be traced to the north of Scotland. We were delighted to receive congratulatory letters from Justin Trudeau, Prime Minister of Canada and Nicola Sturgeon, First Minister of Scotland which were read out at the event. Graham is the son of Blair Fraser, a respected newspaper and magazine reporter of the mid-20th century who sadly drowned on a canoe trip in 1968. 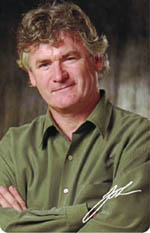 Graham attended Upper Canada College and later studied at the University of Toronto where he obtained a BA in 1968 and an MA in History in 1973. During his career as a journalist, Fraser wrote for Maclean's, The Globe and Mail, The Montreal Gazette, The Toronto Star and Le Devoir. Graham's unusual abilities as a journalist writing in both of Canada's official languages gave him natural qualifications to be Canada's Commissioner of Official Languages. In early 2006 he published a book, Sorry, I Don't Speak French, which reviewed the successes and failures of Canada's policy of official bilingualism. It was largely on the basis of the book and of Fraser's bilingual work experience that he was appointed Canada's Commissioner of Official Languages in September 2006. His wife Barbara Uteck was Private Secretary for the Governor General of Canada from 2000 to 2006 and lived at Rideau Cottage behind Rideau Hall. 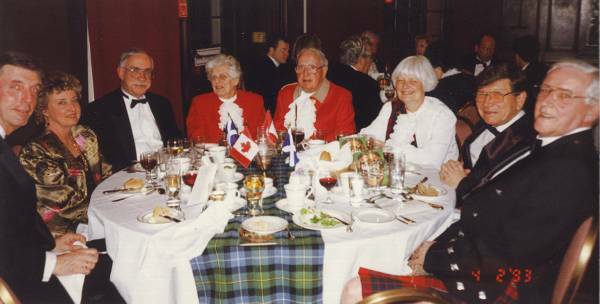 Article and photos provided by Marie Fraser, Clan Fraser Society of Canada and added to by other contributors since.